If there is one thing the Boston Celtics have prided themselves on during these past four seasons, it's been their defense. But it was that very defense that was the cause of their demise Monday night as they dropped a 108-102 decision to the undermanned Houston Rockets. The loss put the C's a full game behind the Miami Heat for the top spot in the Eastern Conference, which gave way to a scary question being posed within the TD Garden locker room. Had the slumping Celtics, playing just .500 basketball in their past 10 games, kissed goodbye to the top spot in the East ... for good? "We just weren't ready," Celtics coach Doc Rivers said. "I told our guys I thought overall it was probably our worst defensive effort in three or four years." The players in the Celtics' locker room had trouble disputing Rivers' harsh assessment of the team's play. "I agree," Ray Allen admitted after being informed of Rivers' comments. "I won't say it's the worst, but I thought there was just a stretch where we just couldn't stop anybody." That stretch would be the entire second half as the Rockets carved up the league's top defense, posting 58 points while shooting an eye-opening 61.7 percent from the field. The onslaught also came without the services of Houston's top scorer Kevin Martin, who sat out with a wrist injury. The loss of the C's top defensive cog, Kevin Garnett, these past two weeks could be seen as a reason for their recent slump as the team surrendered its throne in the Eastern Conference. Rivers, however, wasn't willing to give in to that temptation, as he demanded full accountability from his squad for the lackluster effort. "It's mental. Kevin Garnett didn't play, and it had nothing to do with it." Although The Big Ticket is expected to return later this week, Boston's struggles after Christmas have become a disturbing trend in Beantown these past few years. For the first two months of this season, the Celtics were able to overcome a laundry list of injuries to cruise to a 23-4 start to assert themselves as the top dog in the new-look East. The lack of roster consistency thanks to those injuries, combined with the effects of Garnett's absence has finally caught up to the C's on the floor, as they have dropped two straight in disappointing fashion. Compounding the problem for Boston is the lack of effort once again rearing its ugly head, bringing back memories of regular-season letdowns in years past. While Boston has started to swoon, the rest of the elite squads in the East have stepped up their efforts dramatically. The Heat lead the way, winning 20 of their past 22 games to claim the top spot by a full game for the first time this season on Monday night, after recovering impressively from a 9-8 start. Boston's problems don't end in Miami; both the Magic and Bulls lurk just three games behind the C's. Once an afterthought in the early stages of the East, Orlando has rode its revamped roster to nine straight victories, including a Christmas Day win over the defending Eastern Conference champions. Chicago has also overcome injury woes to string together wins in 16 of its past 20 games to put them in the thick of the hunt in the East. With so many formidable foes looming, the harsh reality for the aging Celtics is that seeding will be crucial in the reloaded East come April. Boston will need to avoid another regular-season slide to improve their positioning and give themselves the best chance at returning to the NBA Finals. "This year's not like last year, where you can coast," Rivers admitted. "You don't have home court this year, you could go home." That knowledge has created a fork-in-the-road moment for this year's squad as they try to overcome its struggles and tread water in order to remain relevant in the conversation for home court. "We're a defensive-minded group and for some reason over the last couple games, it's just not happening," Paul Pierce acknowledged. "I don't know. I mean everyone's got to look themselves in the mirror, check themselves at the door and just figure this out to get through this little skid we're on." The returns of Garnett, Kendrick Perkins and Delonte West should work wonders in giving Boston the opportunity to make their home-court goal attainable. Yet with the other top teams in the East seemingly improving by the day, one has to wonder if the C's reinforcements will be enough for a roster whose biggest challenge may be just staying healthy for when the games count the most. • The Denver Nuggets have the right to trade Anthony whenever they want. But Denver's front office lacks the right to make Anthony agree to sign a contract extension. That's purely in the player's hands. • Anthony would like the financial security of a multi-year deal before this summer's likely lockout. Presently, he can only get that kind of deal from the New Jersey Nets or the Nuggets. Sources say Anthony would likely sign an extension with the Nets if that proves to be the best way he can get closer to his East Coast roots. But as presently constructed they're nobody's dream destination. Perhaps another option will emerge. Anthony has no reason not to let the process play itself out, on the off-chance another team comes up with a strong offer. Greg Oden can become a free agent this summer. Should the Heat pursue the former No. 1 overall pick to bolster their front line? It's a complicated question with layers upon layers of uncertainty. But it's an intriguing proposition, nonetheless -- especially given that the Heat chose to play LeBron James at the 5 in Sunday night's battle against Portland more than any member of their center rotation. Oden underwent season-ending microfracture surgery on his left knee in November, the 7-footer's third season-ending knee surgery since the Blazers selected him first in the 2007 NBA draft. Although his expected return date isn't set in stone, he's aiming to be ready for next season's training camp -- an aggressive timetable considering the extensive, typically yearlong rehabilitation from microfracture surgery. No word yet on how smooth the recovery process has gone so far, but it's fair to say teams will pay close attention to how the 22-year-old responds. Zach Harper, TrueHoop Network bloggers and fans gave their in-game opinions throughout Monday's slate of NBA games in Daily Dime Live. Derrick Rose, Bulls: Rose dropped in 29 points -- including one mean alley-oop dunk -- to spark the Bulls' run past the Pistons. Rose made all nine of his free throws in the 95-82 win. Rip Hamilton, Pistons: Is he traded yet? Hamilton went 0-for-5 from the field in posting a season-low two points in a loss to Chicago. Afterward, Rip offered his take on trade talk: "It's out there. It's nothing that I think about." "The fans that were there, you could hear everything they were saying. It was fun." -- Bobcats reserve Matt Carroll, noting the sparse attendance in snowy Charlotte in a 96-82 win over Memphis. Carroll dropped in 12 points. Jason Bloom (New York): Why would the Nets do this trade? they are giving up so much. Michael Wilbon, ESPN: I must say, it doesn't seem to me like the Nets are on the short end; it seems like the Nets are the immediate winners here, if they're going to wind up with Carmelo Anthony, Chauncey Billups and Rip Hamilton. ... and they keep Brook Lopez. What, exactly, are the Nets giving up? They're in the playoff mix with those four players, even though they have a ton of ground to make up. ... And with Avery Johnson coaching them??? I think if that's the final outcome the Nets will be in pretty darned good shape. 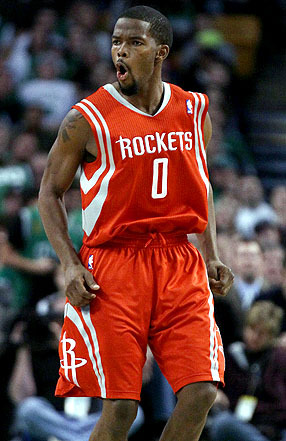 Aaron Brooks of the Houston Rockets celebrates his three point shot in the second half against the Boston Celtics. Brooks dropped in 5-of-8 3-pointers en route to 24 points. Derrick Rose scored 29 points on Monday, giving him six consecutive games with more than 20 points against Detroit, his longest such streak against any team. The last Bulls player to score more than 20 points in six straight games against the Pistons was Michael Jordan, who had a seven-game streak from 1992 to 1995.